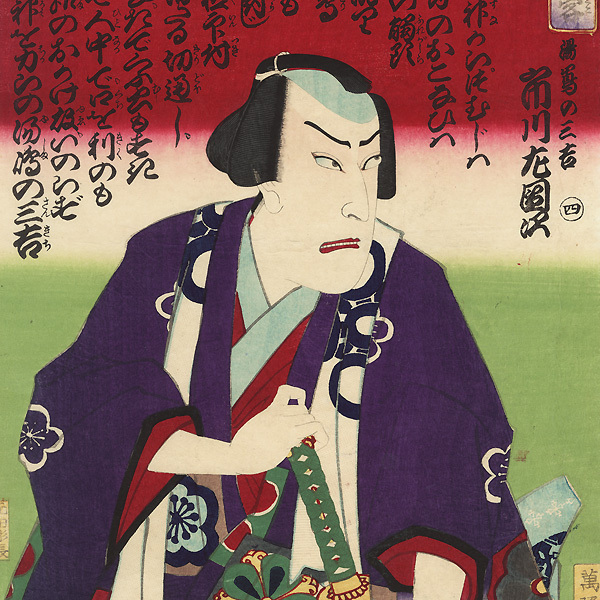 Comments - Great five-panel print depicting "Five Chivalrous Men," otokodate or street knights who protected local people from outlaw samurai. These heroes were admired for standing up against abuse and injustice, and were the subject of countless kabuki plays. 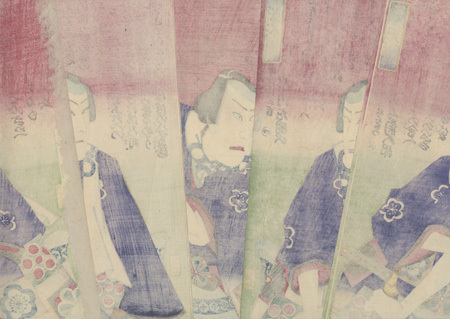 Each figure wears a purple kimono patterned with colorful square motifs over a red under robe, tied with a blue print obi, and has a blue and white towel wrapped around his neck or draped over his shoulders. The characters are set against a background shaded from red to white to green. From left, the actors are Onoe Kikugoro as Negishi no Matsuemon, Ichikawa Sadanji as Yushima no Sankichi, Ichikawa Danjuro as Ueno no Shogoro, Nakamura Sojuro as Nezu no Yaezo, and Iwai Hanshiro VIII as Shinobazu Benkichi. A handsome design with vibrant color and fine line work in the hair, rare to find complete. Condition - This print with excellent color and detail as shown. Five separate panels. Horizontal centerfold. Slight soiling, a few small marks, stain. Please see photos for details. Good overall.